Mayor Eric Garcetti this week unveiled a proposed $8.76 billion spending plan for the 2016-2017 fiscal year, setting aside about $138 million to address homelessness. The plan is 2 percent, or $175 million, bigger than the current year's budget, with about $5.6 billion coming from the general fund. The budget also sets aside $322 million for the reserve fund. This spending plan represents the “first time since the great recession” the city would be expanding the fire department, the mayor said. It calls for the hiring of 230 firefighters to replace retiring ones and to expand the overall number of firefighters. The budget contains more funding for homeless programs than in previous years and responds to a call by city leaders last year to dedicate more city funds to address the tens of thousands of people living on the streets of Los Angeles. “This commitment represents a housing first strategy that we know works ... that came from L.A. but that has not been scaled up enough to deal with the ongoing onslaught of new homeless individuals we see on our streets (who) have been pushed out, whether it’s from jails, foster care, whether it’s veterans returning home from war or folks who are pushed onto the streets by rising rents,” Garcetti said. Nearly half of the money being proposed for homelessness — about $64.7 million — would come from the general fund, plus $6.4 million from special accounts, under Garcetti’s plan. Much of this funding would go directly to the Los Angeles Homeless Services Authority, the primary provider of housing and services for the homeless in the county. 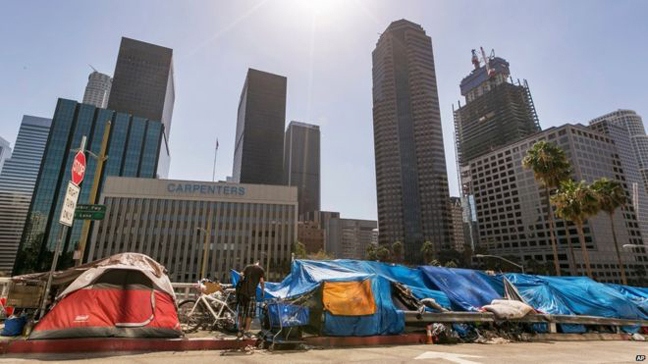 Some funds would pay for “smart teams” in the Los Angeles Police Department that are trained in dealing with people with mental illness, and for “hope teams” that will be deployed to remove encampments and refer homeless individuals to services. City officials said that chunk of the homeless funding comes from “one- time” money, and an ongoing source would be necessary. Garcetti proposed in his state of the city address last week that the city ask voters for more funding. Garcetti is proposing to come up with the rest of the $138 million for homelessness by charging development fees on projects —which would generate $20 million — and by selling off or converting into affordable housing about $47 million worth of city-owned property. The remaining funding would go into the Affordable Housing Trust Fund, which could then be used to build housing for the homeless, though not necessarily during the upcoming fiscal year. The spending plan also in­cludes $12 million for street cleaning, $14.8 million to maintain the police force at 10,000 officers and offer more overtime hours, and $17.3 million to hire and train 230 new firefighters. The proposal also calls for expanding the civilian city workforce by 500 people, part of a larger agreement with city employee unions to hire 5,000 new people over the next three years. The new positions would be created in the Bureau of Sanitation, Los Angeles Police Department, Building and Safety and General Services departments. The budget also includes $31 million for sidewalk repairs, which the city is required to spend under a lawsuit settlement agreement. The release of Garcetti's spending plan starts a budget hearing process, with the City Council expected to review its details and make recommendations over the next few weeks. The first hearing is set for April 27.